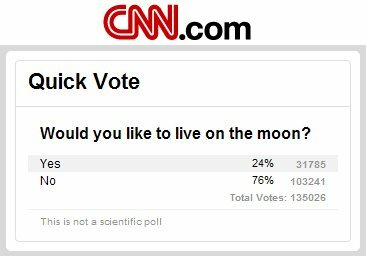 Apparently CNN’s website had a poll yesterday to coincide with the launch of the LRO, which should be taking some neat pictures of the moon and doing an impact study to see what lies below the surface. One of the stated purposes of the mission is apparently to scout out potential sites for lunar colonies, which I’m sure is what inspired the CNN poll. Incidentally, I have similarly expressed positions on maintaining a healthy fantasy life, methods for combating insomnia, and how best to handle fowl. This post was brought to you by Wonkette (notice), Pillow Astronaut (image), and the letter N.